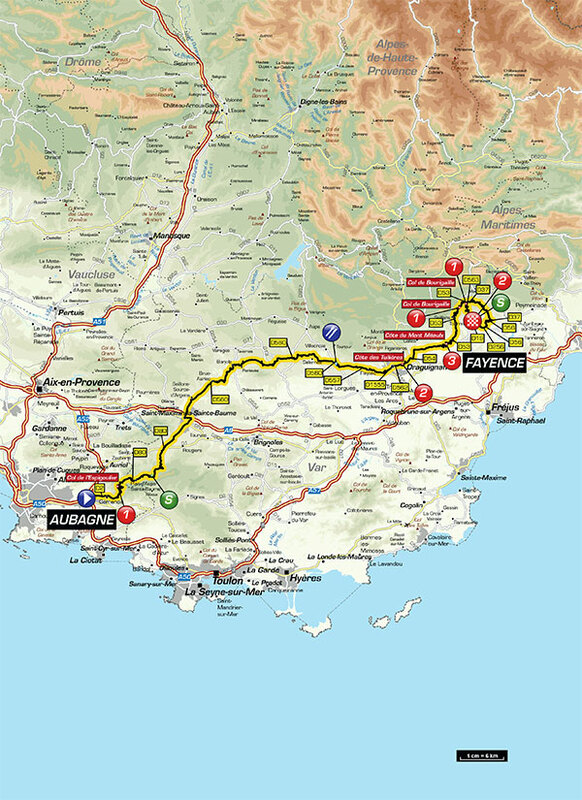 The riders face six categorized climbs today: three 1st-cateogry, two 2nd-category, and one 3rd-category. Km 13.0: Col de l’Espigoulier – Cat. 1, 8.9 km at 5.6% avg. Km 116.0: Côte des Tuilières – Cat. 2, 2.2 km at 7.8% avg. Km 131.5: Côte du Mont Méaulx – Cat. 3, 1.5 km at 4.3% avg. Km 146.0: Col de Bourigaille – Cat. 1, 5.5 km at 6.1% avg. Km 174.5: Col de Bourigaille – Cat. 1, 8.1 km at 5.9% avg. Km 193.5: Fayence – Cat. 2, 1.3 km at 9.8% avg.